House of Aqaurius are a 4 piece band from Sweden, whose influences clearly lie in the early 70's hard rock sound but they like to get a bit spaced out at times and clearly like DOOM rock. The band described themselves as "Four furious space travellers from the distorted side of Reality". The first 5 of the songs were recorded in 2002 and the other 3 are from a previous demo from 2001. "Lord Vermin" is a great rock track with a nice groove. "Cosmic Weed" is a psychedelic rock number and quite strange at times. These guys have some cool song titles as well. "Rock and Roll Grandma and the KKK" is a slow rocker with some distorted vocals. "Nuclear Child" is very Black Sabbath inspired but the production lets this sound down. The last 3 songs ("Apes And Blood", "Unholy" and "Fear No Evil") from 2001 have a totally different sound to them production-wise and the band seem to be experimenting more with some cool guitar sounds and effects. A very cool collection of solid hard-doom rock material. I look forward to hearing a more highly produced CD by this group. 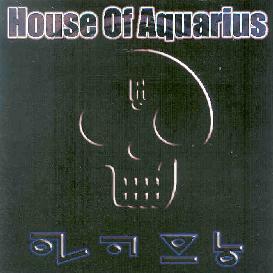 For more information you can visit the House of Aquarius web site at: http://www.popstopp.com/hoaindex.htm. Contact via snail mail c/o P.O.P. Music; PO Box 6168; 600 06 Norrköping; Sweden.